THE INCONVENIENCE OF CONVENIENCE Zetsubou-sensei is angry again, and this time he's turned his sights on Inconvenience. Modern-day inventions are supposed to make our lives more efficient, but the sensei sure doesn't see it that way. TV remote controls are meant to save us time and energy, but how much time do we waste just trying to find the remote? Our cellphones are supposed to keep us connected no matter where we are, but we spend half our time walking around trying to find a signal. Zetsubou-sensei has had it with so-called conveniences! Luckily, he's come up with the perfect solution: "Convenience Through Cloning." 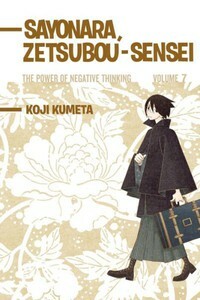 Because what the world needs now is another Zetsubou-sensei, and another, and another and . . .